Vital-Ion Bath, Hair & Body Shampoo and Vital-Ion Body Lotion In the morning to wake up, in the evening to relax and on the week-end as a beauty treatment: Change your bathroom into a health spa for recuperation, refreshment and regeneration. Whether it is the warming or cooling spray from the shower or whether you sink up to your shoulders in water – all these give the body, spirit and soul new energy, lets you forget everyday things and enjoy the pleasure of the water. If you want to give yourself something really special, spoil yourself with a Vital-Ion Bath. Although warm water itself is therapeutic you can increase the effectiveness of a bath even further. With our alkaline Vital-Ion Bath you can restore the body’s equilibrium in a special way. The feeling of relaxation will soon become pleasantly noticeable because our bath additive is also rich in the anti-stress mineral magnesium. The essential oils in Vital-Ion Bath which unfold strongly in warm water, relax body and soul and make the body extra supple. The Vital-Ion Bath is especially rich in minerals and trace elements. These vital ingredients have a strong effect on skin and tissue. They smooth, tone and make the skin soft, the hair shiny. It also stimulates circulation, excretion of impurities as well as oxygenation and activates cell renewal. In a body temperature bath with Vital-Ion Bath you will feel gloriously relaxed and refreshed and also strengthen your immune system by de-acidfication. The active ingredients supplied by nature give you dreamy relaxing moments in the tub. To complete our care program there is the alkaline (for de-acidification) Vital-Ion Hair & Body Shampoo with especially mild, pure vegetable raw materials such as nettle extract and pure essential oils of rosemary, manuka, tea tree, etc. 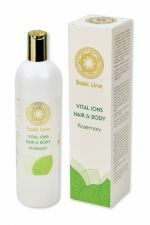 The Vital-Ion Hair & Body Shampoo stimulates circulation, encourages hair growth, refreshes and recharges. Completing our program we have the Vital-Ion Body Oil to give the skin the necessary after-bath protection.